National Sports Services (NSS), formed in 1998, provides extensive services to the sports industry, including municipalities, teams, and the private sector. Beyond team ownership and operations, the firm’s experience includes feasibility analysis, programming, securing capital, securing major vendor agreements, securing facility tenants and users, scheduling and managing major events, and all phases of facility operations. National Sports Services has provided consulting services for nearly 50 different sports franchises, franchises, negotiated more than a dozen facility lease agreements, brokered the sale or acquisition of numerous sports franchises and opened eight new arenas and stadiums. Over the past 60+ years, the principals of National Sports Services have been directly involved with attracting and entertaining over 20 million fans at sporting and other spectator events. On numerous occasions, NSS has assembled investor groups to own and operate franchises. Over the years, the firm has raised tens of millions of dollars in capital and has been involved as an owner of numerous franchises. The client list has included the CEO of W.R. Grace & Company, a $3 billion international chemical company, the President of the Chicago Bulls and major stakeholders in the oil and gas industry, in both Canada and the United States. Over the years, the firm has worked closely with successful developers, investment bankers, founders of companies worth hundreds of millions of dollars, and Major League Baseball organizations in developing stadiums and operating sports franchises. As part of its services provided to teams and stadiums, National Sports Services has secured tens of millions of dollars in sponsorship revenues, including primary naming rights, secondary naming rights, presenting sponsorships, major vendor agreements and other long-term agreements which provide project funding. In addition, the firm has managed all phases of multi-purpose venues, including day-to-day operations, maintenance, labor management, event management, ticketing, concessions, merchandising and marketing. The firm has been instrumental in raising hundreds of thousands of dollars for local charities, churches, schools and youth organizations. 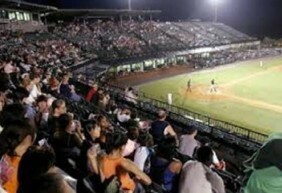 Event management includes the scheduling and operations of events which routinely attract thousands of consumers, including professional baseball, hockey, indoor football, All Star Games, amateur and collegiate tournaments, concerts, assemblies, corporate outings, meetings, circuses, carnivals and any number of additional, spectator gatherings. The firm’s extensive experience can help ensure the long-term success of a franchise, and the maximization of job opportunities, economic benefit, and community involvement to best benefit the team, the landlord and the region.